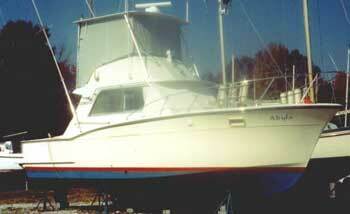 36' Hatteras Sport Fish Convertible, Twin Caterpillar Turbo Diesels @ 420hp each. The boat cruises at over 20 knots depending upon load and sea conditions, With full load she does 29.92kts at full throttle, 2850+ Rpm. With the big power she really scoots along even fully loaded. 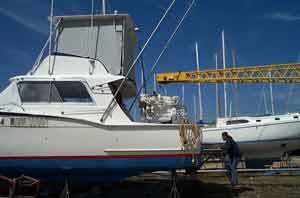 Her she is in the yard at completion of the repower project - pre bow pulpit and spray rails. 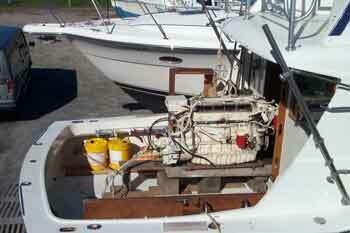 Changing engines requires changes in most other systems including the wiring and engines controls. 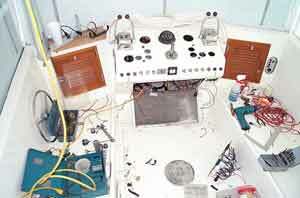 Though it looks like a big mess in process, the finished panel looks pretty good and has proved very functional. The Boatyard forklift broke trying to lift my engines and I needed to get them onboard, so a rented crane did the job. The operator was able to move the BIG crane with unbelievable precision. 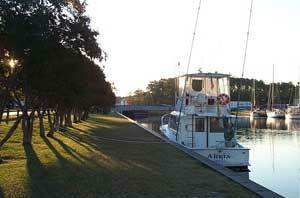 It was relatively cheap too, as I split the time and response costs with the marina as they did other tasks for them. The BIG crane easily lifted the engines over the stern the lowered them down. The boom then extended hydraulically into the cabin. Both cats fit the engine bay with room to spare. 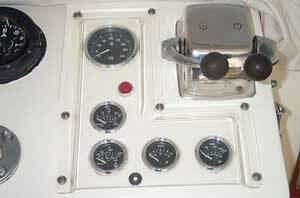 Maintenance is fairly easy because of the space. 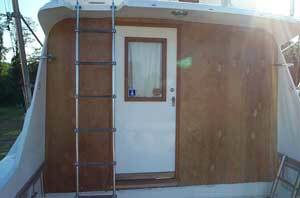 I replaced the aft salon deck due to some minor rot. The starters and alts came off for clearance, but overall it went surprisingly well and we placed the engines right on the beds. After getting the engines in I remade a new aft bulkhead using two plys of marine plywood with two layers of glass on the outside. The bulkhead got sanded then painted with Awl Grip to match the rest of the boat. The window area was then cut out. I made a heavy bracket for the dive ladder that did not bear weight onto the platform and it has worked out very well. The cut out removed and the glass and teak frame that had been saved from the old bulkhead reinstalled. Now it is better than original. The removal of the engines after the rear bulkhead is replaced is much more difficult and requires that they fit through the door. 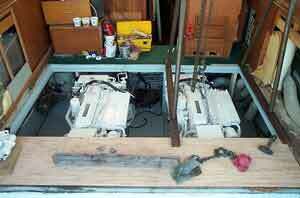 A track is made from 2x12 and shoring to transfer weight to the keel. Engine is rolled in and out on the track using pipe rollers as engine sits on another 2x12. 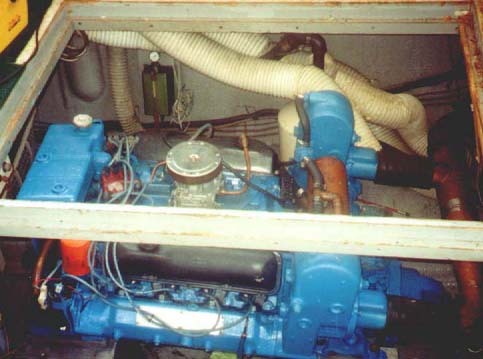 Here is one of the original Criss-Craft engines. Ford 427's with 330 hp. 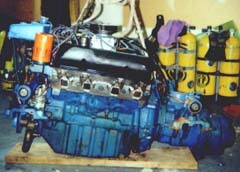 They weighed in at 1570 with all the manifolds and coolers (lots of cast iron). Cat package is 200 pounds more weight, but 100 more HP and lots more torque! The V-8 was actually a tight fit in the engine bay and harder to work on due to the width . In good shape even though 30 years old. A very good marine conversion overall, just old with parts hard to get. Cutting away the rear bulkhead gave easy access and made it simple to replace the old decking as well, but not for the faint of heart as it creates a great deal of work. I had to get the gas out and of course she was almost full. 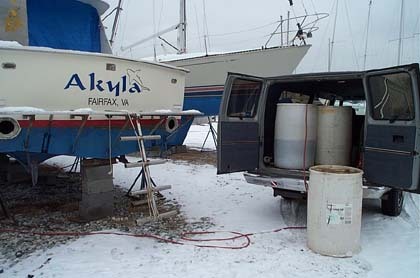 Four 55 gallon drums, an electric fuel pump and 30' of fuel hose did the job. I burned it all in the cars and gave some away. Diesel went back in same way. New power and gear ratios demand new props. I went with the biggest thing that would fit and spin to rated turns, 22x22 with a large disc area and a bit of rake. When I ran her back and forth to Hatteras, I often stop in Great Bridge overnight, it always seems to be where I end up after running all day. Tie ups here are free. In addition to all the stuff you see here, I had to engineer many new systems or make changes to the originals. The things I changed included engine beds, engine mounts, fuel return system, new fuel filters and mounts, new 2" water intakes and strainers, exhaust systems, new battery cables and switches as well as remove all gas engine wiring and put in the diesel harnesses. The big question is would I do this all over again? Absolutely. 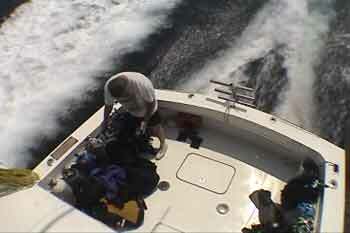 It was a tremendous amount of work, but I now know this boat and all the equipment very well. She runs great and performs to my expectations while using less fuel. She also has a great deal of reserve power for running the inlet or passing the ferries quickly in the tight channels of the sound. 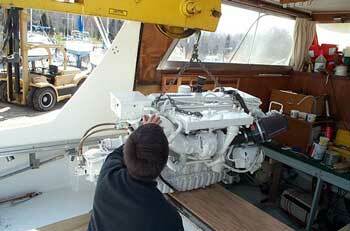 The diesels have real authority and move the boat smartly without straining. 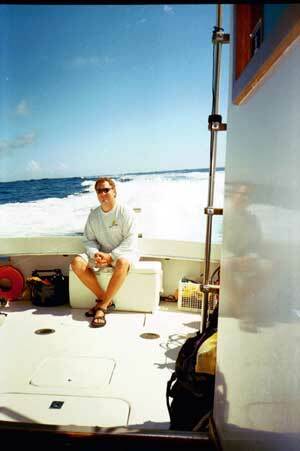 Since posting this several years ago, we have sold Akyla to another Hatteras area waterman who uses it for sport fishing charters. He has since repowered it once again, this time with Cummins Diesel engines and he has made many other modifications to fit the new mission. It is a pleasure to see the old Akyla come steaming past, looking great and going to sea almost everyday of the season.